Researchers at the Center for Quantum Nanoscience (QNS) within the Institute for Basic Science (IBS) achieved a major breakthrough in shielding the quantum properties of single atoms on a surface. The scientists used the magnetism of single atoms, known as spin, as a basic building block for quantum information processing. The researchers could show that by packing two atoms closely together they could protect their fragile quantum properties much better than for just one atom. The spin is a fundamental quantum mechanical object and governs magnetic properties of materials. In a classical picture, the spin often can be considered like the needle of a compass. North or south pole of the needle, for example, can represent spin up or down. However, according to the laws of quantum mechanics, the spin can also point in both directions at the same time. This superposition state is very fragile since the interaction of the spin with the local environment causes dephasing of the superposition. Understanding the dephasing mechanism and enhancing the quantum coherence are one of the key ingredients toward spin-based quantum information processing. In this study, published in the journal Science Advances in November 9, 2018, QNS scientists tried to suppress the decoherence of single atoms by assembling them closely together. 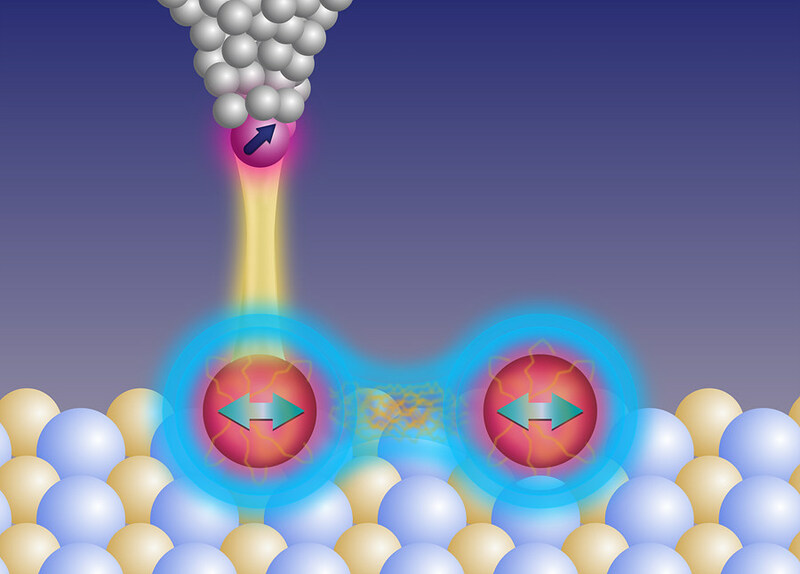 The spins, for which they used single titanium atoms, were studied by using a sharp metal tip of a scanning tunneling microscope and the atoms' spin states were detected using electron spin resonance. The researchers found that by bringing the atoms very close together (one million times closer than a millimeter), they could protect the superposition states of these two magnetically-coupled atoms 20 times longer compared to an individual atom. "Like a phalanx, the two atoms were able to protect each other from external influences, better than on their own." said Dr. Yujeong Bae, researcher at QNS and first author of the study. "In that way the entangled quantum states we created were not affected by environmental disruptions such as magnetic field noise". "This is a significant development that shows how we can engineer and sense the states of atoms. This allows us to explore their possibility to be used as quantum bits for future quantum information processing. ", added Prof. Andreas Heinrich, director of QNS. In future experiments, the researchers plan to build even more sophisticated structures in order to explore and improve the quantum properties of single atoms and nanostructures. The Center for Quantum Nanoscience, housed on the campus of Ewha University in Seoul, South Korea, is a groundbreaking research center merging quantum and nanoscience to push the boundaries of human knowledge in basic research. Powered by Korea's Institute for Basic Science, which was founded in 2011, the Center for Quantum Nanoscience researches the behavior of atoms and molecules on surfaces; exploring the potential of the smallest building blocks that humans can use to create engineered quantum systems. Lead by world-renowned physicist Andreas Heinrich (A Boy and His Atom, IBM, 2013), QNS is dedicated to bring top scientists from around the world to their state-of-the-art facility to conduct research that will unlock the secrets of the quantum universe. IBS was founded in 2011 by the government of the Republic of Korea with the sole purpose of driving forward the development of basic science in South Korea. IBS has launched 28 research centers as of August 2018. There are nine physics, one mathematics, six chemistry, eight life science, one earth science, and three interdisciplinary research centers.